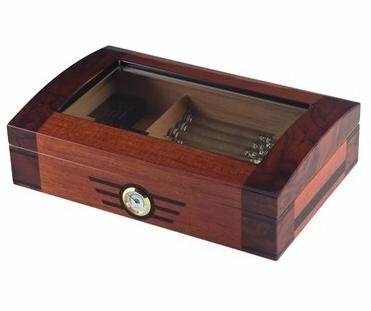 This contemporary cigar humidor combines style with functionality. Features a great seal, external hygrometer, solid brass hinges, beveled glass top, solid hardwood with high lacquered veneer and Spanish cedar interior. Comes with an engravable brass plate and humidifier. This piece will look elegant and spice up the decor of any room. Beveled Glass Top Arched Top 30 Cigar Capacity Streamlined Art Deco Design Fully lined in Premium Kiln Dried Spanish Cedar Spanish Cedar Divider Spanish Cedar Tray Humidifier Included Hidden quadrant hinges Felt lined bottom to protect your furniture Multi wood tones. Measurements: 13" X 8 1/2" X 3 3/4"
If you have any questions about this product by Orleans Group Humidors, contact us by completing and submitting the form below. If you are looking for a specif part number, please include it with your message.